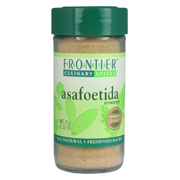 Asafoetida overcomes its reputation for an unpleasant aroma and initial taste by enhancing other flavors and imparting a garlic/onion bite to a variety of ethnic dishes. Become a convert by trying it sparingly with grains and beans, and be sure to stock up on it if you like Indian food. 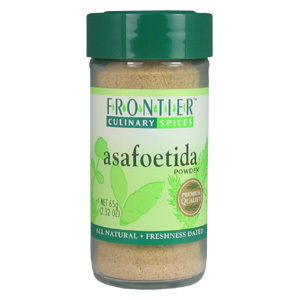 Asafoetida must be stored in an airtight container as its strong odor will affect other foods and spices. Asafoetida is an oleogum resin obtained from the living rhizomes and roots of Ferula assa-foetida, a branching perennial relative of fennel. In its most pure form (tears) it is a solid or semi-solid mass, with an intense, pungent, alliaceous odor, and bitter, acid taste. When used in minute quantities it enhances and blends the flavors of other spices, and imparts a delicate, onion-like flavor. Asafoetida Powder is shipped in a discrete, unmarked package. Orders are processed immediately and usually take about 3 to 5 working days to be received. We do ask that you try it for 2 to 3 weeks to feel the full effects. Any information received is used only for order processing and shipping purposes. Your information, such as e-mail address, will never be disclosed to a third party.